LG Parada P940 seems to be a new member of LG Parada series. 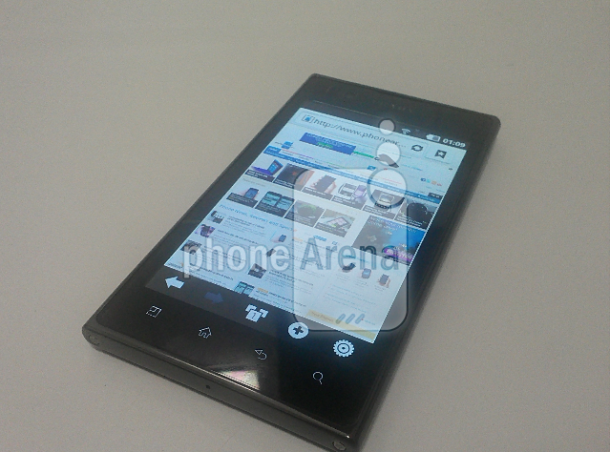 We got some pictures of this next Android phone. According to unnamed source, LG Parada P940 is possibly LG Prada K2 . The handset which you are seeing isn’t the final design of third version of LG Parada series. The specs of LG Parada K2 smartphone are quite impressive. It will run on Android 2.3 Gingerbread OS and will have a dual-core processor for fast processing. LG Prada P940 handset will be designed with Dual-camera; one is 8MP rear facing and second is 1.3 MP front facing. It will provide support to 21 Mbps HSPA+ support that’s mean you would be able to download and upload at a blazing speed. It will feature with a “Prada-inspired” textured backing and be only 8.8mm thin. The best feature of Parada P940 handset is 4.3 inch NOVA display. It is expected that LG Parada K2 will hit the shelves this quarter but one thing is uncertain for us; we don’t know whether it would be launched in U.S. market or not.